Three of us got one of these in our Xmas stocking, two of us adults and one college student. The adults thought “Hmmm…good for camping and opening beer.” and the student thought “Perfect for the dorm! (and beer)”. Eating prepared food in some dorms is against the rules and even finding cutlery is a possible fine. So we declared it the “Stealth Spork” and then one of the ladies in the room brandished it in her fist declaring it a great self-defense weapon. 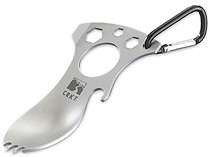 The CRKT Eat’N Tool is now known in our house as the “Killer Stealth Spork”. I love this and plan to buy more as gifts. A service for 8 set with a whopping 45 pieces. 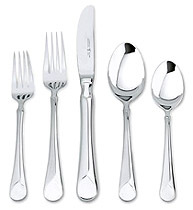 The thing that strikes me most about this set is that it’s 18/10 stainless steel that looks and feels like silverware. But no polishing and it is dishwasher safe. Use it everyday and use it for the special occasions. It’s Henckel so you know you are getting quality. This would be a wedding present the future couple would use for years.